Dwayne Williams and Robert Kaufman III have been instrumental in the development of UTSA's cybersecurity programs. (Jan. 30, 2018) -- Two cybersecurity faculty members at The University of Texas at San Antonio (UTSA) are among three individuals inducted into the San Antonio Cyber Hall of Honor. 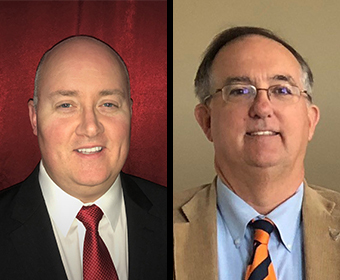 The 2017 inductees include Dwayne Williams, associate director at the UTSA Center for Infrastructure Assurance and Security (CIAS) and Robert Kaufman III, a lecturer in the UTSA Department of Information Systems and Cybersecurity. The class was officially inducted on Monday, January 29 at the Henry B. Gonzalez Convention Center in conjunction with The CyberTexas Foundation. The inaugural class of 2016 recognized Gregory White, director of the CIAS, and Glenn Dietrich, professor of information systems and cybersecurity. Williams joined the CIAS in 2002 and has more than 24 years of experience in information systems and network security. His experience includes six years of commissioned military service as a communications-computer information systems officer in the United States Air Force, specializing in network security, corporate information protection, intrusion detection systems, incident response and VPN technology. During his time at the CIAS, Williams has led efforts for professional, college and high school level cyber competitions, such as the Collegiate Cyber Defense Competition and Panoply cyber competition programs. He was also a co-founder of the CyberPatriot National High School Cyber Defense Competition. Kaufman served 21 years in the United States Air Force with his last tour being as the director of operations for the Air Force Computer Emergency Response Team. He has been instrumental in the creation of UTSA’s first Supervisory Control and Data Acquisition Security Lab and teaching Wounded Warriors a basic computer security course. He has also worked with the University of Texas’ Institute of Transformational Learning to put UTSA cybersecurity courses online. Kaufman is very active in student success by ensuring many UTSA graduates find security jobs with San Antonio businesses and large security companies at the national level. His students work in security at small businesses, local banks, oil and pipeline companies, major defense contractors, major insurance and information technology companies, and investment firms across the city. Since 2003, he has volunteered his time to be a judge for UTSA’s National Cyber Collegiate Cyber Defense Competition. The San Antonio Cyber Hall of Honor was created to identify and recognize those who have innovatively forged new paths across San Antonio and around the world. Honorees understand and accept the pronounced risks, challenges and profoundly lead the way in creating of one of the nation’s preeminent cyber ecosystems. Learn more about the UTSA Center for Infrastructure Assurance and Security. Learn more about the UTSA Department of Information Systems and Cybersecurity.